While Bauma 2019 exhibitors pursued environmental excellence, visitors did not. Digger Disneyland or unconquerable foot-slog across three quarters of Bavaria? Regardless of your personal take on the Bauma exhibition, there can be little question that last week’s iteration of the triennial event was not just the biggest but also the best. More than 3,700 exhibitors occupied 614,000 square metres of indoor and outdoor exhibition space and attracted visitors from an astonishing 200 countries around the world. This was not just an exhibition: it was a celebration of man’s ingenuity; an acknowledgement of the industry’s ability to turn imagination into innovation; a global gathering of engineering excellence the likes of which has not seen before. Against such an astonishing backdrop, it feels churlish and almost disrespectful to highlight any negatives. But regular readers of this newsletter know that this is my stock in trade and will likely expect nothing else. My first point, therefore, is not so much a criticism as an observation. Within the vast, sprawling confines of the Messe Munchen exhibition centre, everything runs like clockwork and is the very epitome of German efficiency. When I registered for the show, I did so using my LinkedIn profile which automatically filled out my details and saved me time. Despite the vast daily crowds, I passed through the turnstiles more quickly here than I have ever done at the considerably smaller Hillhead show. Show signposting was faultless, staff were helpful and – thankfully – multi-lingual. And while they offered only a temporary respite from the endless hike around the show, a network of moving walkways offered at least some assistance. All that being said, by my fourth day I was actively fighting the desire to punch in the head anyone that walked into frame while I was taking a photo; anyone that walked too slowly, stopped suddenly, or who changed direction without warning. I also have a personal issue with paying six Euros for an “apple juice” in which apples were less an ingredient and more a passing acquaintance of the coloured water within. But these are minor gripes of a renowned curmudgeon. Outside the exhibition centre, however, it was a different story. Both Google Maps and the iOS version on my iPhone claimed that our Air BnB accommodation was a 12-minute drive away from the West entrance to the show. In five days, we never achieved it in under an hour. On the Tuesday night, it took nearer three. Roads were blocked in every conceivable direction by countless taxis and, although I am basing this purely on personal experience, it appeared that Uber cars had effectively been banned from the showground and were instead clogging up approach roads by double-parking while waiting for their passengers to navigate the ensuing chaos on foot. Spare hotel rooms were about as common as hen’s teeth and any that could be found last-minute had tripled or even quadrupled their rates. You have to be pretty enthusiastic about plant and equipment to pay more than 400 Euros a night from something akin to a Travelodge. According to a very quick Google search, Munich has a population of 1.4 million people. The influx of more than 50 percent more people for a week is always going to place a strain upon local infrastructure. But I left with the very real feeling that while the Messe Munchen can take Bauma in its stride, I am no longer convinced that Munich itself can do likewise. As I said previously, that is merely an observation. My second criticism, however, is more than that. It is addressing a veritable herd of elephants in the room that everyone seems very eager to gloss over. 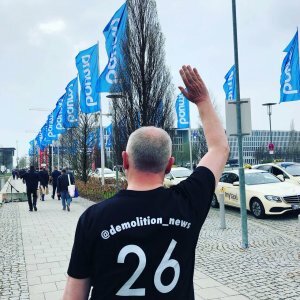 There were many themes at Bauma 2019, and telematics, automation and autonomous machine control were key among them. But the over-riding theme was the way in which machines are fuelled and powered. Stage V regulations loom on the horizon like a gigantic clean-freak that is determined to ensure that even the most powerful machines in the industry run on nothing stronger than fairy breath. As a result, each manufacturer is forging its own path towards even greater engine cleanliness. During Bauma I saw electric, diesel electric, hybrid and even one machine that will soon run on bio-methane (or, as one wag in the crowd so eloquently put it “will be powered by farts”). And that’s a good thing. Even the die-hards amongst us that still long for the roar of a smoky diesel engine know that ever-increasing levels of cleanliness is the right and responsible thing to do. There is just one small problem with that ambition. As I said earlier, all these clean running machines and engines attracted more than 600,000 people; people that travelled from 200-odd countries around the world; people that will have taken planes, trains and automobiles to get there; people who would then spend several hours each day say in the rear seat of a gas-guzzling Mercedes taxi as they fought their way through the local traffic to the safe refuge of their over-priced hotel room. Major manufacturers such as Case, Caterpillar, Hitachi, Komatsu, Liebherr, Volvo and a whole host of others have invested billions between them to make their machines as clean-running as current technology will possibly allow. And yet, for a week in Germany, much of that hard work was negated as owners, operators, enthusiasts, tyre-kickers and – of course – journalists descended upon Munich once more in whatever form of planet-destroying form of transport took their fancy. Perhaps the greatest irony is this. Several manufacturers – including both Caterpillar and Doosan – demonstrated the ability to remotely-control a machine literally thousands of miles away. Those manufacturers have afforded us the ability to safely operate, monitor and maintain machines on the other side of the planet. Yet, for some reason, in order to evaluate or report upon those same machines, we still feel the need to travels thousands of miles to see them “in the flesh”, neatly polished and standing still in an exhibition hall. The next Bauma is scheduled to take place in 2022. All things being equal, I will be there. But this time, I might just take a bicycle. Posted: April 15th, 2019 under General.